Generally, establishments can choose among different cooperation partners for innovation. However, the choice of a particular partner is pivotal to the success of any cooperative arrangement for innovation and therefore not an easy one. The ensuing analysis uses a comprehensive firm-level dataset of Central, East and Southeast European (CESEE) and Former Soviet Union (FSU) countries to shed light on the role of different cooperative arrangements – cooperations with domestic suppliers, domestic client firms, foreign suppliers, foreign client firms and with external academic or research institutes – for a product innovators’ success, captured in terms of either annual average sales per new or significantly improved product or, alternatively, the probability of applying for a patent. 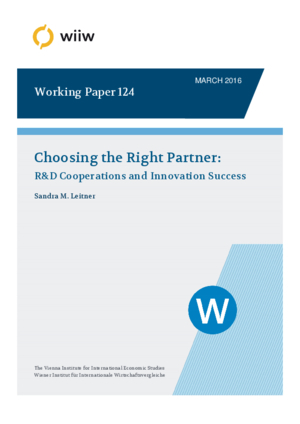 It demonstrates that the choice of cooperation partner is essential: Innovators profit greatly from innovation partnerships with foreign suppliers only in terms of higher sales from novel or improved products but, in turn, are less likely to apply for patents if engaged in cooperative arrangements with foreign suppliers or client firms, indicating that patenting is probably predominantly undertaken by foreign cooperation partners. Furthermore, it highlights that establishment size, ownership structure, trading status or absorptive capacity greatly matter and that the institutional environment is essential for an innovator’s commercial success, which assigns a decisive role to policy-makers in building an environment that helps innovators extract returns to innovations to the fullest extent possible.